12 July 2010: A second-generation Chinese Filipino, Robredo was born in Naga in 1958, to Jose Chan Robredo, Sr. and Marcelina Manalastas. He attended Naga Parochial School, a private Catholic school, and then the Jesuitical Ateneo de Naga, the only Catholic high school for boys in the city. 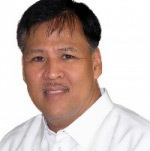 Jesse Robredo has been shortlisted for the 2010 World Mayor Prize. Update August 2012: Jesse Robredo died in a plane crash on 18 August 2012. He then studied Industrial Management Engineering and Mechanical Engineering at the Philippines De La Salle University. Later he was Edward Mason Fellow and a graduate of Masters in Public Administration at John F. Kennedy School of Government, Harvard University in Cambridge, Massachusetts in 1999. In 1985 he obtained his Masters in Business Administration at the University of the Philippines in Diliman and was received the Graduate School and Faculty Organization award for scholarly excellence. In 1980 Robredo joined the San Miguel food and drink corporation in its Physical Distribution Technical Services department of the General Services Division. Within six months he was promoted two grades higher and sent to the finance division for another six months. When his immediate superior was moved to Magnolia, the ice cream division of San Miguel, he was invited to join him. He was assigned to logistics planning and concurrently functioned as staff assistant to the physical distribution director. Returning to Naga City in 1986, he was became Program Director of the Bicol River Basin Development Program, an agency tasked to undertake integrated area development planning in the region's three provinces. In 1988 he was elected as Liberal mayor of Naga City, making him the youngest City Mayor of the Philippines at age 29. He was able to transform the city from being underperforming to one of the "Most Improved Cities in Asia", as chosen by Asiaweek Magazine in 1999. Hailed for his effective leadership, he was elected President of the League of Cities of the Philippines in 1995. He was also elected Chairman of the Regional Development Council (regional planning and coordinative body of Bicol's six provinces and seven cities) from 1992 to 1998. Robredo’s achievements in office include most recently: Most Cost-Effective City in Asia by the United Kingdom's Foreign Direct Investment Magazine (2005); Public Service Awardee for Local e-Governance from the United Nations Department of Public Administration and Finance (2004); Women-Friendly City Award from the UN-Habitat and the UN Development Fund for Women (2004); Model City for Government Procurement from the World Bank and Procurement Watch (2003); CyberCity Awardee for its i-Governance initiatives from the United Nations Development Program (2002); Dubai International Awardee for Improving the Living Environment from UN Habitat (1998). Ten Outstanding Young Persons of the World (1996) and the Ten Outstanding Young Men of the Philippines. He also received the Konrad Adenauer Medal of Excellence as Most Outstanding City Mayor of the Philippines (1998) and the first ever "Dangal ng Bayan" Award of the Civil Service Commission. In 2000, he became the Ramon Magsaysay Awardee for Government Service. In July 2010, Robredo stepped down as Naga City mayor to join the cabinet of newly-elected President Noynoy Aquino as Secretary for the Interior and Local Government. The appointment process for Robredo to head up the important Department of the Interior and Local Government was somewhat protracted on account of the wish of Vice President Jejomar Binay (until the election, mayor of Makati City) to serve in the post. It was also speculated that the appointment of Robredo to the post would serve to reopen a number of old wounds early on in Nonoy’s administration on account of his rigid anti-corruption stance and stinging criticism of a number of Filipino mayors for their unethical practices in office. Robredo was the founder of the Kaya Natin! movement against corruption in local government. Naga is located 377 km southeast of the capital Manila. Though located in the Bicol Region and its economic centre, Naga City itself enjoys independent status of the surrounding Camarines Sur province. Bicol is seen by many political observers as enjoying largely liberal and left of centre tendencies on account of its estrangement from the main portion of the Luzon island. Inhabitants of Naga are known as Nagueños. Naga is the centre of the Metro Naga area, which consists of the main city and 14 surrounding municipalities, which are administered on an intercommunal basis by the Metro Naga Development Council. Having been established in the early 1990s, the body is seen as an early example of Multi-Level Governance in the developing world by local government academics. Robredo has chaired the Metro Naga Development Council since 1995. Nominations were accepted until the 17 May 2012. A shortlist of 25 nominees was published on 18 June. VOTING IS NOW TAKING PLACE and will continue until the middle of October. 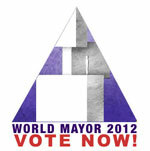 The winner of the 2012 World Mayor Prize and other results of the World Mayor Project will be announced in early December 2012.